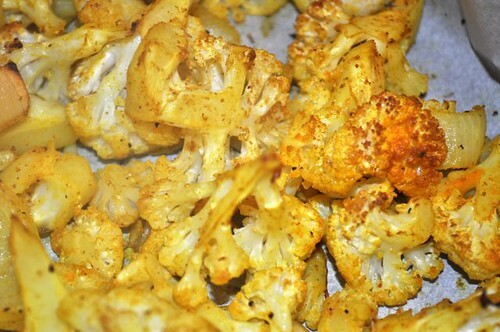 You can’t really give yourself a bigger boost in the health department than grabbing a head or 2 of cauliflower before you head to the checkout each week at the grocery store – it’s like having Bruce Wayne, Clark Kent & Peter Parker for dinner a couple of times a week – literally, talk about super dinner guests! And like those super guests, that’s exactly what cauliflower is doing for your health – warding off all things nasty, has your back when nothing else seems to, and like those dinner guests, have been known to wear a dunce cap or 2 from time to time. If industry advertisers got smart – instead of outfitting a head of cauliflower in plastic wrap like its Lady Gaga, they’d sure make their point on the health front, and move a heckuva lot more heads of cauliflower if the big white heads were sporting tight little muscle shirts with a big ‘ole “S” on the front – well, you gotta start somewhere! 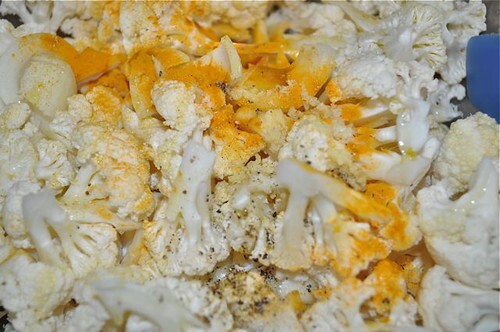 And with the many, many, many ways to prepare cauliflower, there are just no more excuses for bypassing this superfood which is in desperate need of a makeover – let’s put it this way, if cauliflower was a room in your house – ’nuff said! 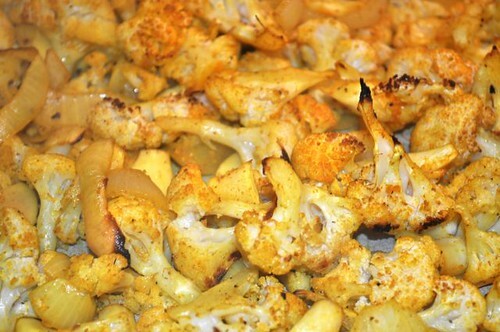 So on that note, meet Indian-inspired roasted cauliflower – eat as is, add it to salads, put over pizza, stir it up with pasta, purée with a couple of cups of stock for soup, or a little less for a dip – and that’s just off the top of my head. Just think where we could go if we actually thought about it. 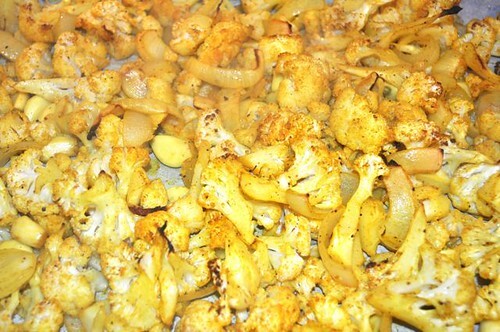 Now, let’s roast some cauliflower. 1. 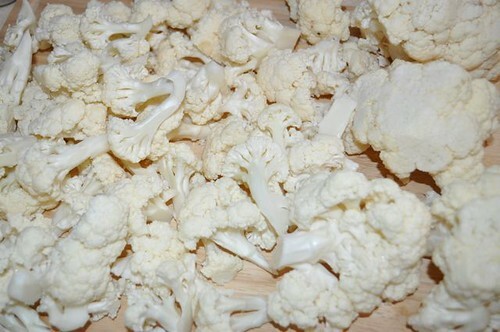 Cut up a head of cauliflower into florets, stems and all. 2. 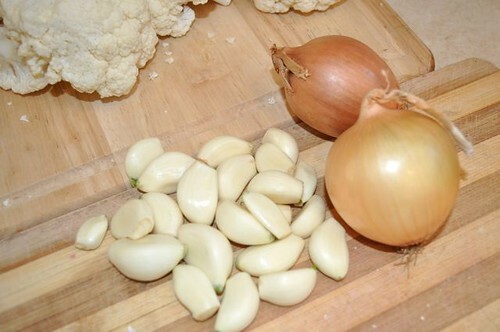 Peel as much garlic as you like – it’s going to be chopped & roasted so don’t be alarmed at the number. And chop up a couple of onions. 3. 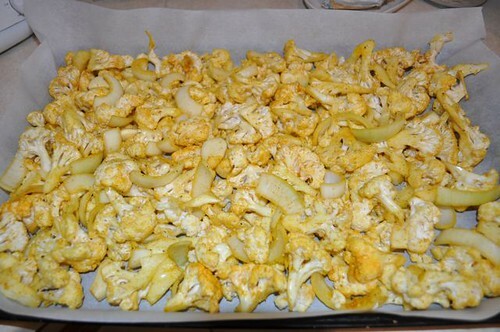 Add the garlic and chopped onions to the cauliflower and spread out on a baking pan. 4. Drizzle with a healthy swirl of olive oil. 5. 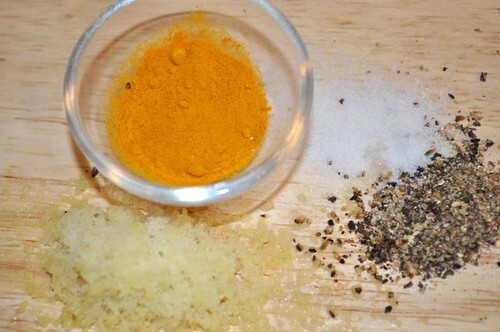 Gather the other players – grated ginger, salt, freshly ground pepper & turmeric. 6. 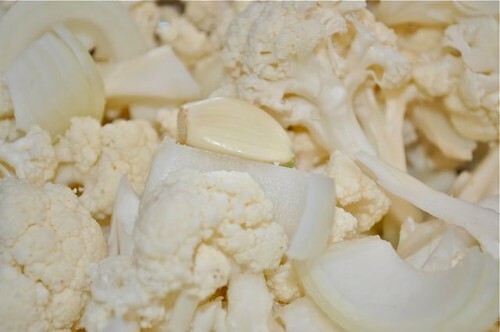 Add that to the cauliflower mixture and stir around to coat evenly. 7. Spread it in a single layer and it’s ready for a hot oven. 8. Give it a stir when it starts to sizzle and brown. 9. Keep roasting until it’s all nice and toasty brown. 10. See how nice and roasty, toasty this is getting. 11. Pull it out of the oven and devour it any way you see fit. 3. 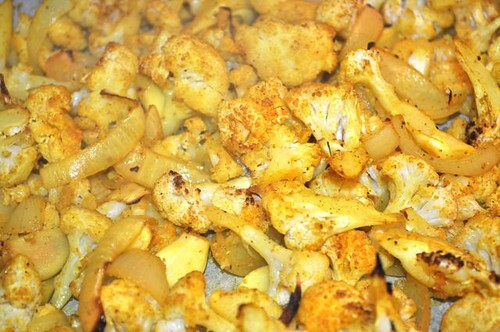 Once all the cauliflower is nicely coated, roast until lightly golden, give it a stir and continue roasting until just tender and toasty brown – about 20-25 minutes in total. As you flex your creative muscles, taste and season as you go. These are ideas for you to springboard into culinary heaven with! This was great! 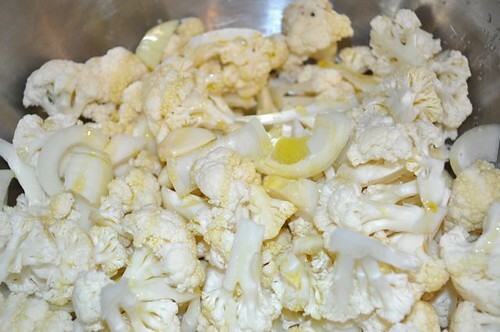 I started making it and realized I had no onions, so I just went ahead with the cauliflower and garlic and it was still awesome. Can’t wait to try it with the onions next time. I will definitely be making this again. So easy.